Fresh Strawberries, Vodka Jello, Pink Tinted Whipped Cream, A Moist Festive Party Cake. This cake is for adults only. Perfect festive holiday colors. Omit the alcohol for children's cake and add fruit juice instead. Enjoy! This cake is very colorful and tasty. If you love a fruit flavored cake with jello and alcohol you hit the jackpot. This is pure comfort cake for any adult party. You can really use any liqueur you prefer. I think vodka is our first choice as it goes well with lime flavors. The cake can be adapted to no alcohol cake for kids, you can choose any colors you like to coordinate your party themes. Substitute fruit juice for the alcohol. This cake is perfect for a holiday, birthdays or any picnic event. You can easily transform the colors to match your party theme by using jello and food coloring. The cake is made from scratch but if you want to save time just use a yellow cake mix. This is a cake made from scratch that is made with jello and alcohol. A true party adult cake. This is refreshing moist and perfect all year long. Preheat oven to 350 degrees F (175 degrees C). Grease and flour one 9x13 inch pan. Mix together the flour, baking powder, and salt; set aside. In a large bowl, cream sugar and shortening until light and fluffy. Add eggs one at a time, beating thoroughly after each addition. Add flour mixture alternately with milk, beating just to combine. finally, stir in vanilla. Take 1 cup of batter and add green food coloring to it. Pour rest of the batter into the prepared greased and floured pan then pour the green batter on top. Bake cake according to package directions. Dissolve Jello in 1 cup boiling water and 1/2 cup liqueur. Let cake and Jello cool. Prick cake all over with a fork. Pour Jello mixture over cake; refrigerate 1 hour. Beat pudding and milk. Add vanilla and food coloring. Fold in Cool Whip. Spread on cake and chill. Optional: Fresh Strawberries cleaned, sliced when in season or use frozen, and one bottle strawberry ice cream syrup. Other jello package suggestion combinations: orange jello and vodka, pineapple jello and coconut rum and lemon jello with limoncello, using other extracts and flavorings and they all are wonderful. Use whatever combo you like! Spiked cake...who knew?! I love it! What a pretty cake, and fun for a party! 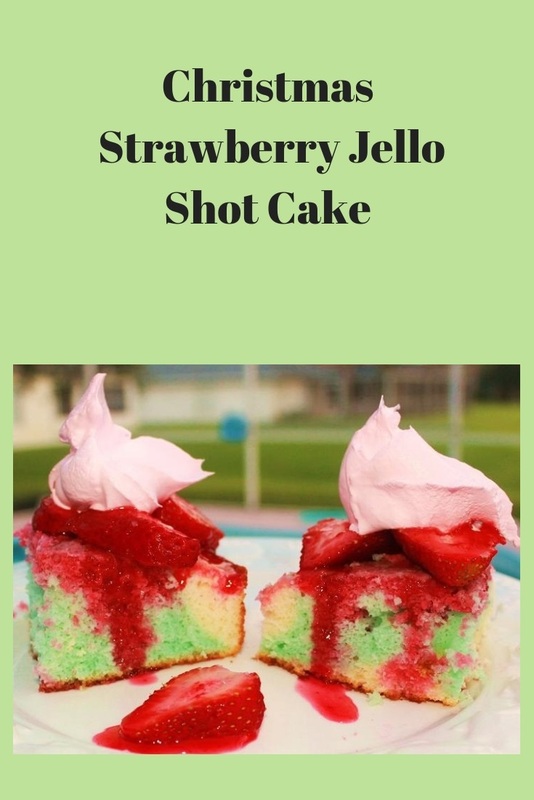 Who needs Jello Shots when you have Jello Shot CAKE! Awesome! What an excellent festive cake! I like that it is spiked with vodka or rum, so cool! Oh, very, VERY nice! Would make everyone start dancing on the tables. Really is cake to drink haha - love it with rum or vodka! WOW This is perfect for New Years Eve Claudia. The pineapple coconut combo would be great with pina coladas, a tropical Florida New Year! vodka and rum,wow,sounds so festive andlooks so good! A very colourful and festive cake! Oh.. it seems so luxurios! I will make it, for sure. Un'idea geniale la tua torta per le festività. What a fun idea - spiking cakes is always fun during the holidays and the colors just sing the season. Ha! Such a cool cake. Perfect for a party. Your cake is so pretty! Lovin the jello shots - such a fun idea! How to WOW the guests. Perfect! Very festive for Christmas or a party. Like the shot idea! Never underestimate the power of JELLO!...awesome cake, I never tired of making all kinds of Jello desserts in the seventies and eighties, and my children loved them. Now, my little grandchildren think it's some kind of "foreign object" from Mars! Your beautiful and yummy Jello cake brings back fond holiday memories! You had me at vodka~what a festive cake my dear! I've had jello shots, but never had them in a cake! Definitely festive--what fun!